One-Handed Cutlery With Lightweight Foam handles. Designed for those with a weak or painful grip, this range of cutlery comprises of stainless steel utensils that have been mounted into lightweight foam handles - that can be used for one handed eating by combining cutlery functions. Example: the splayed fork is a pronged fork but with edges designed for cutting food, and with a deep rounded body that works like a spoon. 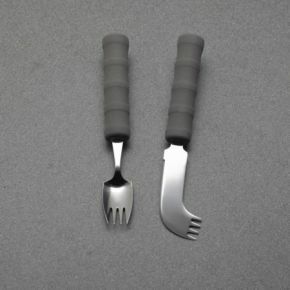 The Nelson Knife is a knife with a cutting edge, which ends as a curved pronged fork, that enables food to be picked up. Comfortable to hold and washable (although not recommended for dishwashers). The young man using these items can now feed himself without the embarrassment of spills or having to be fed. Thank you for your help when the wrong item was delivered, easily rectified by you. The cutlery has made life easier for my mother who has recently had a stroke. My mum hasn't used these yet but both of us felt they would be really helpful - what a good idea.